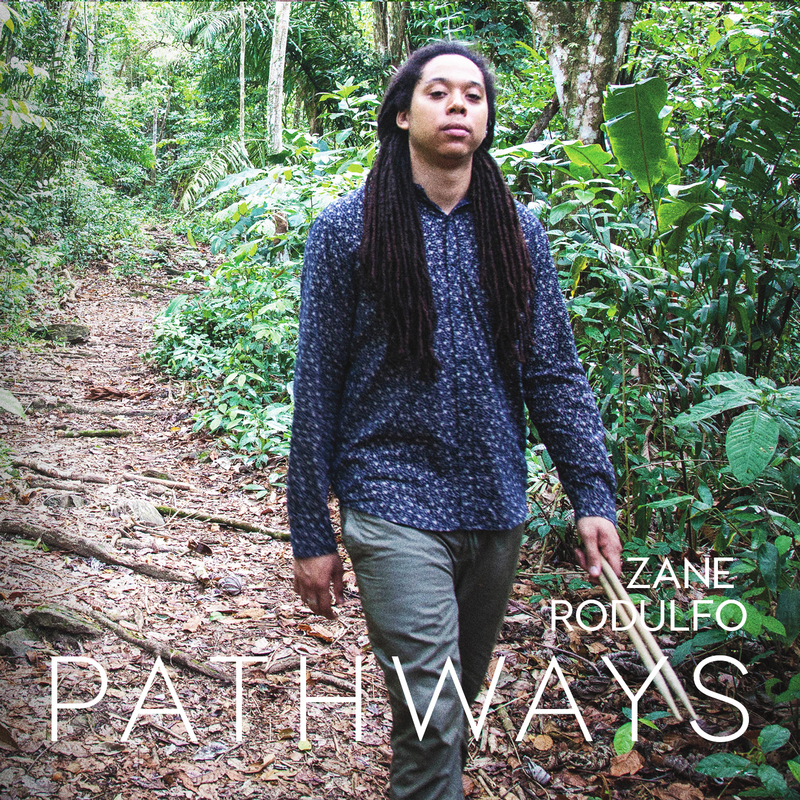 If a record cover can be any indication of the content of the music it encases, then Pathways, by drummer/composerZane Rodulfo, has the perfect depiction. It shows Rodulfo walking along a well-worn rainforest trail, drumsticks in hand with a look of absolute confidence that he knows where he is going. Hailing from Trinidad, he has been in the states since his teens, and after some serious education and training, has released his first recording as leader. In the African Yoruba teachings, “Abiku,” is a child that has died before puberty, and can also mean the spirit that took the child. With this mystical conflict in mind, it is a fitting title for the opening song, which circulates within a boundless dimension of tempo variations. Saxophonist Dayna Stephens supplements with finesse, easing the journey into another presence, as the steel pans of Earl Brooks Jr. wish enchantment on the traveler. Delving deeper into ancient acumens, Rodulfo came up with “Trismegistus,” the thrice named Hermes of Greek mythology, representing Thoth or Tehuti, the Egyptian god of wisdom, learning, and literature. This is a buoyant number with bassist Luques Curtis interacting with twin guitarists Nir Felder and Marvin Dolly in the forefront, as Stephens does spatial variations on the EWI (electronic wind instrument) for a curious and astral texture. “Seek,” is a floating, meditative ballad, that evokes an introspective glance at the alternatives along the way. As if representing what already was, “Retrospect,” offers a chance to analyze the past with the chance of altering the future. This track features deft piano work by Noble Jolley, who weaves his melody around the piece with silken phrasing, leading to a dramatic turn in its closure, portraying suspense. The only number not penned by Rodulfo is “Hourglass,” which is the contribution of Marvin Dolly. Here, the steel pans make another appearance, this time at the hands of Victor Provost, applied in a comfortable manner, they complement the arrangement, while adding a Caribbean essence. Drummers make motivating democratic leaders and composers, for they put all the pieces together, hand it over to the accompanists in the band, then sit in the back, keeping time. Zane Rodulfo is a student of not only the music, but of the cause and effect behind the source. He cast a wide conceptual net over the project, drenched in assurance that the object is near. Exhibiting flashes of his Trinidad heritage at the right times and in proper doses, Pathways is a reflection of a maturing drummer who has a myriad of influences and is taking them in his own direction. ← Collage by Chris Klaxton Reviewed by All About Jazz!